Vintage-Inspired Accessories: Scarves & Hair Accessories! To continue last week’s post on vintage-inspired accessories, here are some more great vintage-inspired scarves and hair accessories! These may be some of my favorite pieces ever, because they can add so much visual interest, spicing up just about any outfit. Product Information: Oscar de la Renta Floral Scarf, Chick Downtown Vintage Collection. Sweet Nothings Scarf, Modcloth. Native Loom Scarf, Forever 21. Vintage-inspired scarves, like most vintage-inspired accessories, have a specific detail that makes them either whimsical (like the ModCloth scarf – how cute is that cupcake?) or classic (like the floral print of the Oscar de la Renta scarf). Both knitted and silk scarves are so easy to find in vintage stores – one of my friends left a thrift store once with three silk scarves, each only seventy cents! So keep your eyes peeled in your favorite vintage and thrift stores. Product Information: Super Skinny Jeans in Black, American Eagle Outfitters. Kenneth Cole Reaction Borderline Boot, Planet Shoes. Chunky Cable Cardigan, Forever 21. Multi Bangle Stack in Gold, Peep Toe Shoes. When you find the perfect vintage-inspired scarf, you want it to be the standout piece of your outfit! I paired the beautiful floral print Oscar de la Renta scarf with a simple cream colored sweater, some great skinny jeans and a pair of almost flat boots to keep the outfit casual. A stack of bangles can add a little sparkle and a touch of visual interest without visually overpowering the scarf. Silk scarves can go with just about everything, but for me, it’s all about keeping the outfit simple and letting the beautiful scarf bring all the attention to your even more beautiful face! Product Information: Zip Up Hair Bow, Topshop. Night Lily Headband, ModCloth. Rose Kirby Grips, Miss Selfridge. 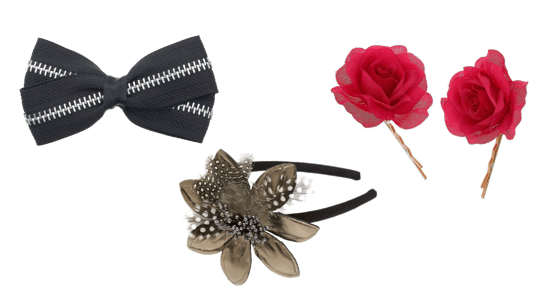 I love these hair accessories – headbands and bows are some of my favorite pieces, and in general, I love using decorated bobby pins (like the ones from Miss Selfridge) to pin back my bangs. You can find lots of hair accessories in vintage shops – the trick is to know which ones to buy and which ones to avoid! Always look for pieces that have visual interest (as always), but also make sure they are clean and feel sturdy. Also, make sure any piece you choose is made out of something you can clean and/or disinfect (which you will want to do before you put it on your head). Product Information: Holiday Party Dress, American Eagle. Flower Button Shrug, Style for Less. Green Animal Bangle Pack, Dorothy Perkins. Lopez Pumps, Cutesy Girl. This floral headband from ModCloth is a great piece that you can make casual or dressy – depending on what you pair with it! I decided to pair it with a plain black dress and some classic black pumps, before adding a sweet colored shrug and some bangles to provide a little more sparkle. You could also just as easily pair the floral headband with jeans, a sweater, and some heels or flats for a more casual look. This would be a great outfit for a date (just make sure to throw a coat on top so you don’t freeze!) or for going out for the night with your friends. What do you think of these vintage-inspired accessories? What would you wear them with? What would you like to see covered in a vintage-inspired article? I love to hear from you guys so let me know in the comments!